It was kind of a crazy idea. 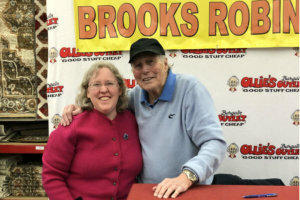 A brand-new Ollie’s Outlet was opening in Towson yesterday, and Orioles legend Brooks Robinson would be there to sign autographs. You had to be one of the first 200 people in line at 7:30 a.m. to get a ticket to meet him. Then you had to come back at 10 a.m. for the autograph session. It would take all morning. The craziest part? It was happening on a Wednesday—a school and work day. And I don’t usually have the children miss school for much beyond medical appointments. But…well…our sons have been wanting to meet a real baseball player and get his autograph. And when I casually mentioned it to my mother earlier in the week, she started talking about a friend of my grandmother. My baseball-fan brothers who live out of town seemed surprised that I would even be debating going. 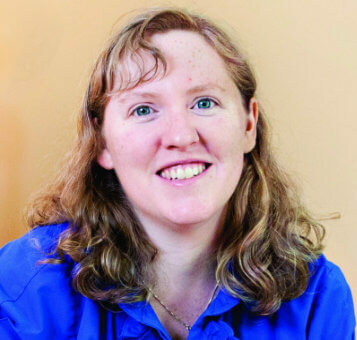 “If I lived in Baltimore, I would be there,” one said. 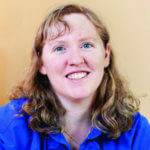 And I, a Baltimore girl who grew up with Cal and Eddie as my heroes, couldn’t shake the idea that we should try it. In a worst-case scenario, we wouldn’t be able to get tickets and the boys would be a few minutes late for school. In a best-case scenario, we would meet the best third baseman of all time. It didn’t seem that risky. “Mmmph,” I said and went back to sleep. But I did finally get up and woke up the boys. Our younger son was all in. Our older son was on the fence. He doesn’t like to have to make up schoolwork, and he didn’t want to miss jazz band practice. I didn’t want to persuade him, but I didn’t want him to regret missing it. He finally decided to join us. So off we went. 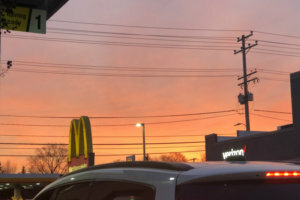 The sun was rising as we stopped at McDonald’s for Egg McMuffins. 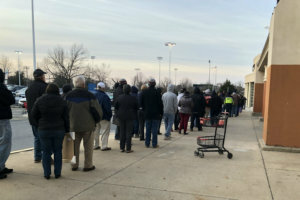 At about 7:10 a.m. we pulled into Ollie’s. The line was long, and the main conversation topic was how many people were in line ahead of us. Was it 200? No one could decide. But we had plenty of time for conversation with these new friends. We talked about the Orioles and the players of the 70s and 80s and how amazing Brooks was. The line was long, and I wondered whether we could get tickets. Luckily, it turned out that we were numbers 119, 120, and 121. We got our tickets and jumped back into the car because I had realized we had time to drive back for our older son to get to jazz band practice. But at a stop light near home, I glanced at the tickets and saw that the autograph time was 1 p.m.—not 10 a.m. as had been advertised. We didn’t want to miss it. I also didn’t want to overhaul our day. At this point, though, we were committed. 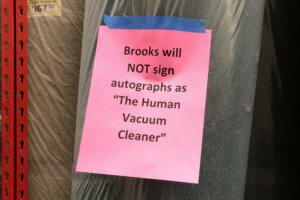 We were going to meet Brooks. So my younger son and I drove 20 minutes back to the store to check the time. Yes, it was 10 a.m. We drove home, hung out briefly, and went to school to pick up his big brother. Then we were on our way! This was really happening! Nothing could stop us now! Back at Ollie’s, the store and parking lot were packed. We were excited just to watch Brooks signing other people’s autographs while we waited our turn. Each of my boys had picked out a baseball card from the pile of cards at home with Brooks on it for him to sign, and they waited very patiently. We could see how he was smiling as he met each person and taking a little time with each one. We chatted with our old friends who had been in line with us earlier, and we made a few new friends too. We learned that the first people in line had been there at 5 a.m., and I sort of admired them. “Wouldn’t it be cool to be ticket No. 5?” one of our boys asked. And I agreed. But I was happy for that little bit of extra sleep and content to be No. 121. 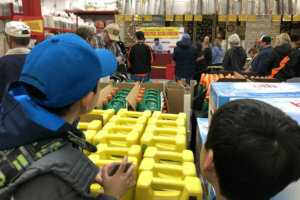 One autograph-hunter tried to get my sons to have something signed for him, and I turned him down politely and then a little more firmly when he came back a second time. We could each have one thing signed, and our boys were committed to the baseball cards in their hands. 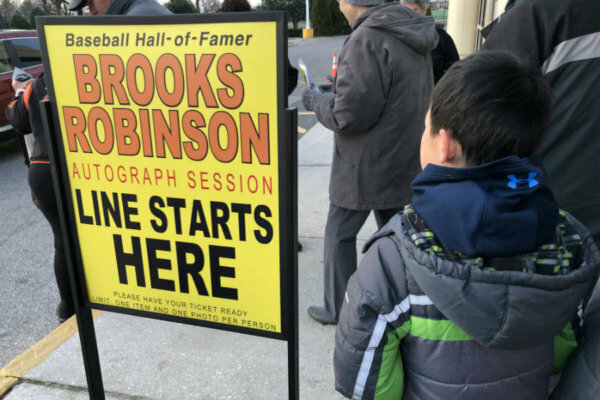 Most people waiting were in a wonderful mood, excited to be there and happy to be remembering the days they had seen Brooks Robinson play. “Certain people are born to do certain things and this was his thing,” said a woman who was near us in line. We listened to the stories and enjoyed the wait. After a little more than an hour and after snaking through the rug section, it was our turn. 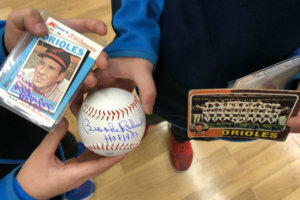 Our fifth grader went first, stepping up to meet Brooks Robinson who smiled and commented that our boy wasn’t in school. “We’ll be there in time for math class,” I joked from the side. But I don’t think Brooks cared. He seemed to have all the time in the world for my children—especially since there were only two other children in the bunch. Our third grader followed and again Brooks smiled at him and made sure the photographer took a nice photo with my phone. Then it was my turn, and I stepped up. “I’m the delinquent mother who took her children out of school to make a family memory,” I said. Brooks smiled and immediately started asking about the boys—where were they from, was it difficult to go through the adoption process, did we have to travel to China many times, were they brothers? He listened and smiled the whole time, asking questions and really listening to my answers. All I had planned to say was, “Thank you for playing for the Orioles. Thank you for being part of an amazing team. 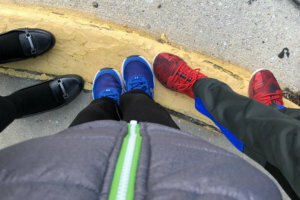 Thank you for being someone my children can look up to.” But he was asking so many questions, and good questions, that all I could say was, “Thank you.” In that amazing moment of personal connection, it was enough. After the Ollie’s employee took a photo of Brooks with me, Brooks Robinson himself called the boys over to get a photo of us all together—even though the rules had clearly said one photo per person. But rules are made to be broken on a special day when you’re skipping a little bit of school to meet a baseball legend. “I’ll be watching for you boys in another 10 years!” Brooks said. And we were on our way, full of excitement, bubbling over with the story of our encounter with a real Hall of Fame member. Driving back to school to get to the last few minutes of math class, we couldn’t stop talking about the experience—how kind Brooks Robinson was, how amazing it was that we got an extra picture, how much fun it was that only 200 people got his autograph that day and we were three of them, and on and on and on. Some days you go to school because wonderful things do happen there, too. But some days are made for adventures. And some days you have to carve out a little time to meet a new friend and make a new memory together.